Following in the footsteps of the previously two SOLD OUT figures, Superplastic have once again teamed up with Pete Fowler to bring you a new colourway of the Maximillian Ca$h figure. This super-hot Gothic Sunset colourway was revealed today and is now available to purchase! Give thanks for this joyous new colour! Limited to 333 pieces, Max Ca$h stands at 10inch tall in his world famous bomber jacket. This damn old-man hipster is gonna look super fly in your collection. 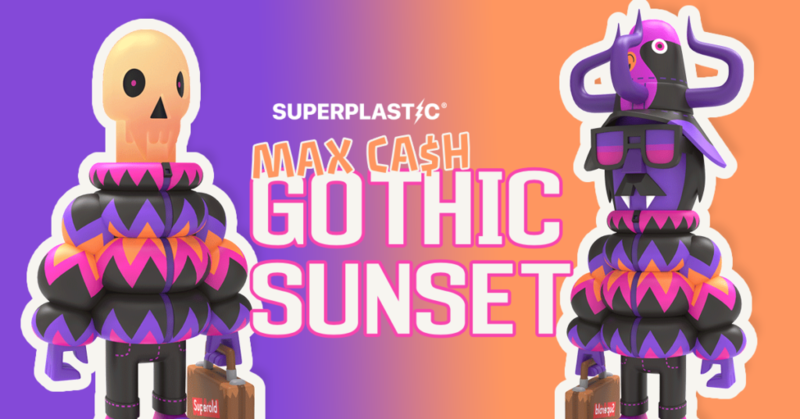 Each Max Ca$h Gothic Sunset includes a removable head, revealing a transparent orange skull underneath. If transparent orange skulls ain’t your thing, then perhaps designer toys ain’t for you. Priced at $90 (£70) + shipping, Max Ca$h Gothic Sunset can be purchased HERE. Superplastic, if you’re looking for them online, can be found on Instagram HERE. Pete Fowler can be found hiding on Instagram HERE.